Check out this "Quick Start Guide and TORGuard Demo"
Order the "TORGuard Anonymous VPN" Service! TORGuard keeps NO logs...they're the best in the business! Click on the image to go to TORGuard.net and start protecting yourself today! Still curious and want to learn more? Here's a more advanced explanation if you have some time. I was like you and not sure I needed this. I went years with no problems and then it happened to me. I should mention that I'm the guy that has Norton 360 and cross-cut shreds everything. You will spend months straightening out an identity theft. The damage done in minutes took me upwards of 40 hours to correct and it still pops up now and again. I locked my credit with a "Credit Freeze" within a day of the first sign of trouble but it was too late. 15 credit cards had been applied for, a cell phone purchased, my wife's Macy's account was charged on, a U-haul was rented and not returned for days. I won't go on but each of these will require hours of your time to fix as you have to call each merchant and fax police reports to clear your name. Some of the damage you may not even know about for months. Needless to say, I've done my research so you don't have to. TORGuard is the best in my book. I fly the B-777 all over the world and I can tell you that IT WORKS! Buy the annual subscription to their "Anonymous VPN" service.... it works out to $4.99/month. It will be the best money you've ever spent. They e-mail you a link right away to download the software (you can use it on up to 5 simultaneous connections for the one price). Don't get distracted by SSH Tunneling, SSTP, etc, etc. Just click the first link to the software downloads page and download "VPN Lite" or "VPN PRO - Viscosity". I've used them both. They both use the OpenVPN protocol and connect to the same TORGuard servers. The Pro has a cool little graph to show you download speeds and a few extra settings if you want to get fancy. You login to the hotel Wifi....pick a server and click connect. THAT'S IT...you're up and running! If you want to use TORGuard on the iPhone just download the "TorGuard" app...super easy and self explanatory...just put in your TORGuard Username and Password and click "Connect". Enjoy your Netflix and forget about the firewalls! In my personal speed tests using VPN sometimes slows down my internet but not to a degree that really makes any difference. In some cases I've even had the opposite effect and noticed a slight increase in speed. I'm not a tech guy so I can't explain it other than to tell you that my fears of really slowing down my connection have not ever been realized and I'm completely happy using VPN. 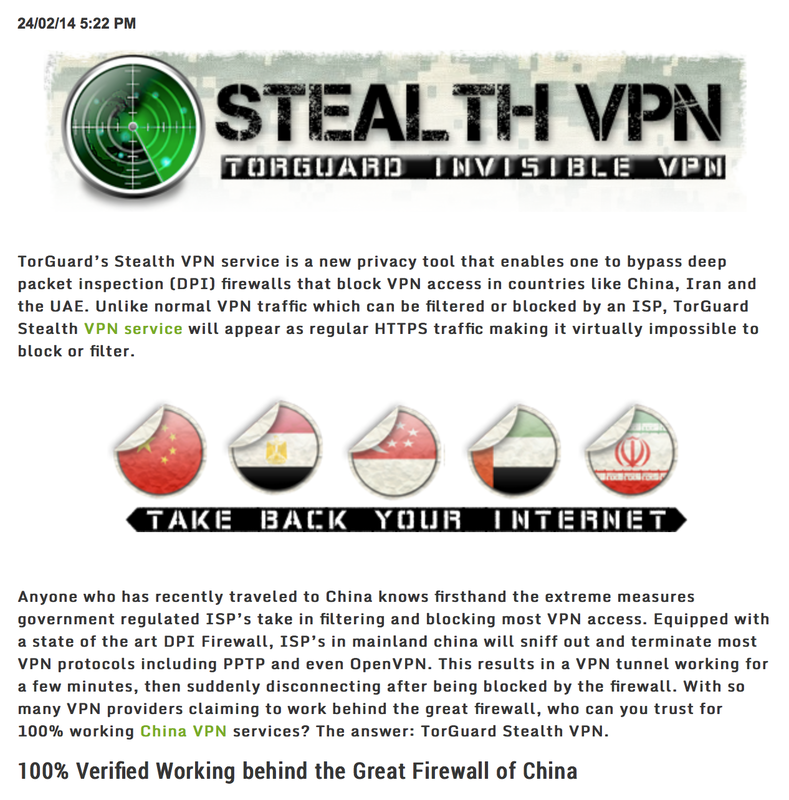 If you're in the Middle East or China I use the "Stealth VPN" connection which is bulletproof and bypasses any firewall. The Chinese also employ DNS Poisoning so you'll want to change your DNS settings. You'll find instructions at Changing DNS Settings. Enjoy peace of mind and do it today!